If you find the Ribbon taking up to much space, space that would be better used viewing your slides as you edit, there is a great option. Here is the standard Ribbon view. Right-click to the right of the tabs along the top and there is a “Minimize Ribbon” option. The result is the ribbon disappears and frees up a lot of editing area. When you click on any of tabs the ribbon appears. Click away and it disappears again! Most people have a handful of presentations that they access routinely. PowerPoint has had the ‘Recent Documents’ feature to make it easier to reopen those presentations – and it is a helpful tool many times. 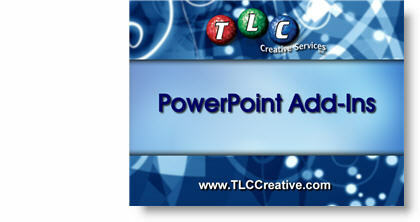 But PowerPoint 2007 has made that feature even more powerful and usable. Here is the PPT 2007 Start Menu and mine shows 1 Recent Document (okay the list was full, but I cleared it for this tutorial). The important addition to PPT 2007 is the small thumbtack icon on the right. 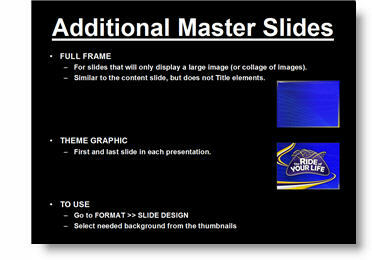 It is the same icon that has existed since PPT XP on the Master Slides to preserve masters. 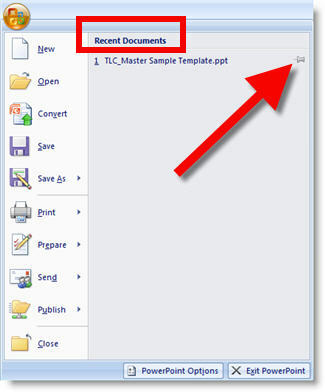 The one on the Recent Documents does the exact same thing – it preserves that presentation to always be in the Recent Documents list! Because many templates I develop have additional master slides, I let the end user know what they are by adding a slide that explains and shows each additional master slide. As example, here is a slide I added to the end of the template sample slides that explains 2 of the additional master slides. It also shows a thumbnail of each and has a quick “how-to”. In PowerPoint, Photoshop, Word and many other applications you can turn on a ruler to confirm size, alignment, etc. Enter the very cool JRuler application! 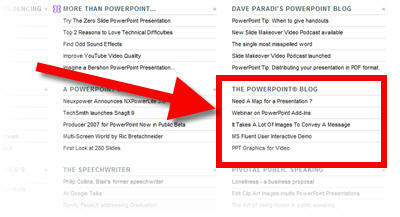 Here we can see the PPTBlog banner is 740px wide. – JRuler is a free download (download here). Courtesy of my daughter Kelli, I have this fun and disturbing (I read it without any problem and then asked what was so cool about it…) little note. I will have to find a presentation to use this in! I am very excited because I finally finished all of the demo’s for the AudioSolutionz webinar that I am doing in just a few days (hey, I have been traveling almost non-stop for the past 3 months – and it has (almost) all been PowerPoint related shows). The thing that I really became aware of was the best way to add power to PowerPoint is to know what add-ins are available and to know what they do see them demonstrated. That is the really great part about a live a webinar is that it allows me to do more than make a recommendation, I can demonstrate each add-in with real-world presentation examples. Click here to get details on the AudioSolutionz webinar. Hope to see many of you there! It’s always a good day when you are added to a noted technology evangelist’s website! In this case I was just sent an email saying they found my blog from a link on Guy Kawasaki’s AllTop website. Click here to go to the site. It does has a big collection of presentation specific blogs and websites. One of my favorite applications, SnagIt, has just this week released the completely redesigned version 9. There is a new Microsoft like ribbon navigation (works great) and some new image management tools. Get all the details, pricing and download options here. Download.com also has a good review of it here. Need A Map for a Presentation ? One of the best deals available is the map collection from an educational supplier. eSchoolMaps has a huge collection of U.S. and global maps that are supplied in several formats. The .emf version is not only compatible with PowerPoint, but already on slides which can be inserted into any presentation! And all can be modified with custom fills, resizing, etc. But best of all, the entire collection is just $40! Look at it here. This is a bit informational and a bit self-promotion – on Friday, June 20th I will be speaking for AudioSolutionz (a division of Eli Research) on what PowerPoint add-ins I use daily. I will also be overviewing a number of add-ins out there as well as an open Q&A session (about add-ins). Click here for the Audio Solutionz page with all the details (and fees).